Denali Grand Tour – A complete tour all the way around Denali! $335 per person – 1 1/2 hours. Flight times may vary. $425 per person – 2 hours with Glacier Landing. All flights subject to 5.5% transportation fee. The Denali Grand Tour takes you completely around the mountain. 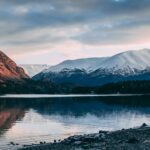 You’ll see the highlights of both the McKinley Experience (our basic tour route) and the McKinley Flyer (our extended south side tour) before crossing the divide over to the north side and a completely different landscape. Our passengers claim that flightseeing Denali in this way is the highlight of their trip. See Mt. McKinley from all sides during your flight – North, South, East & West. Soar over Kahiltna Pass after seeing the Climber’s Base Camp at the 7,200 foot level of the Kahiltna Glacier. 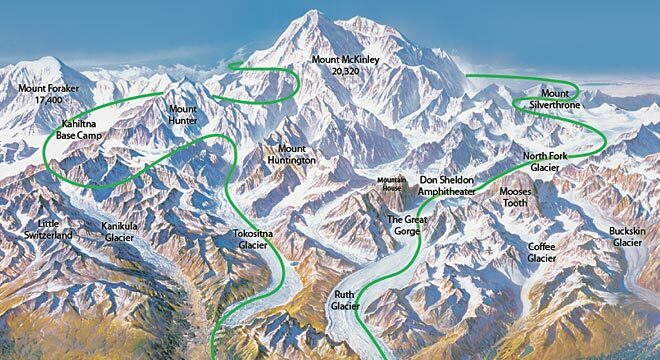 Discover McKinley’s famous West Buttress Climbing Route.Cross over the divide of the Alaska Range into a different world filled with alpine tundra and fewer glaciers. View the immense Wickersham Wall – approximately 14,000 feet of continuous rise of rock and ice. You will talk about this tour of Denali and Denali National Park forever!